A major reservoir in the South Bay is now much less vulnerable to a major earthquake. Bob Redell reports. A major reservoir in the South Bay is now much less vulnerable to a major earthquake. This week, the Anderson Reservoir in Morgan Hill fell below 68 percent capacity: the maximum allowed by the state and federal government because of seismic safety concerns. 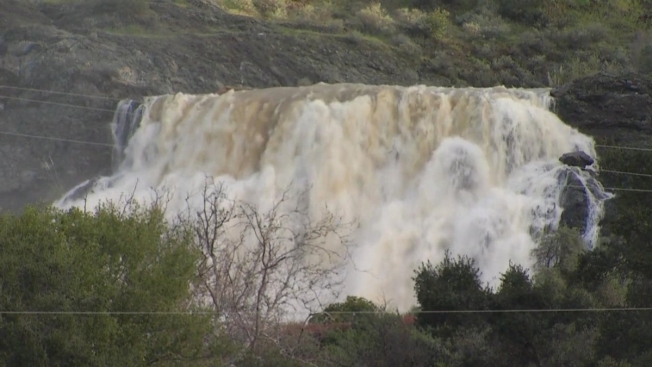 This winter’s rainstorms sparked concerns as the reservoir filled to full capacity, gushed over the spillway and flooded downstream into San Jose. If there had been a magnitude 7.25 quake on the Calaveras Fault at the time, the damn, which was built in 1950, could have failed. The Coyote Dam, located above the Anderson Reservoir, will also begin to reduce, Grimes said. The Santa Clara Valley Water District, which operates the Anderson Dam, has been releasing water from the reservoir since the start of the year. Officials will continue to do so until mid to late May. By then, water district officials hope Anderson Reservoir is down to 58 percent and Coyote Reservoir to 50 percent. In 2020, the district is expected to start a four-year $400-million seismic retrofit of the Anderson Dam.